This velvety soup pairs the gentle flavor of sautéed leeks with sweet, roasted squash. Topped with a dollop of sour cream and a few caramelized apple croutons, it embodies everything cozy about autumn. Make the croutons: Peel and core the apple and halve it lengthwise. Using a mandoline or a very sharp knife, cut the apple into very thin slices. Line a baking sheet with parchment paper and spread one layer of apple slices on top. Sprinkle with the brown sugar. Bake slices for 20 minutes at 350 degrees until crisp. Transfer to cooling racks and let cool completely. Make the soup: Leave the oven at 350 degrees. Place the squash, cut side down, on a baking sheet and bake until tender, about 40 minutes. Let cool slightly and gently scrape or cut the flesh away from the skin (Delicata skin is edible, but not tasty in this dish). Set aside. Melt the butter in a saucepan over low heat. Add the leeks and thyme and stir occasionally until soft and brown, 10 to 15 minutes. Stir in the stock and the squash and simmer over medium heat for 20 minutes. Season with the salt and pepper. 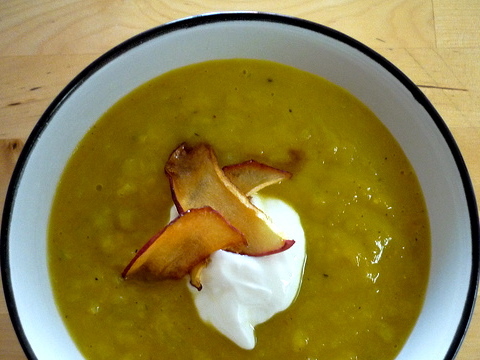 To serve, ladle hot soup into individual bowls, then top with sour cream and the apple croutons. Read more about Rosh Hashanah in Leah Koenig's "Rosh Hashanah goes sustainable."